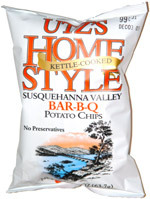 Taste test: These potato chips had a much different feel than any other Utz we've tried, with a slightly thicker cut and a much moister feel upon biting in, much like other chips cooked in soybean oil. The barbecue taste was pretty good, and the chips left a hot aftertaste in the back of the throat. Smell test: Kind of an oily chip smell with a little sweet barbecue mixed in. This snack was discovered by Jim O'Brien (but not the basketball coach) at White Hen Pantry, Porter Square, Cambridge, Massachusetts. Review published .